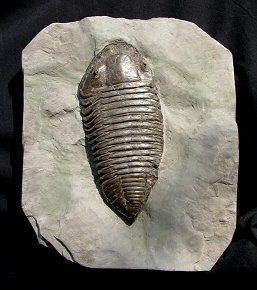 Size: Trilobite is 6.4 inches long! This is a beautiful US trilobite. It is an adult Trimerus delphinocephalus from Middleport, New York. This specimen was recently acquired from the famous Eugene Thomas Collection. This is the largest and one of the rarer types of trilobites from the Rochester Shale. This gigantic specimen is complete and is OVER SIX INCHES LONG - very few types of trilobites found in the United States are this large. The amazing specimen displays beautiful natural coloration, and the thick shell exoskeleton has exceptional detail preserved. The massive bug is almost perfectly centered on the rectangular block, not on the edge of the plate like so many Trimerus. The fossil is also very inflated and 3-D for this type. This is a HUGE, top quality specimen of Trimerus delphinocephalus, one of the most displayable examples we have ever seen.